Your Subconscious Mind Holds the Key to Improving Speech Impediments Such as Stammering and Stuttering! Steve G. Jones, Ed.D., Clinical Hypnotherapist, charges $1,500 for a custom recording and $25,000 for a one-hour private hypnotherapy session at his office. But you can get all the benefits for this low price. Simply listen to the Stop Stuttering Hypnosis MP3 every night as you go to bed for three weeks and feel the changes happening in your life. You will feel more empowered, more in touch with your true self, and you will truly know that your goals are within your reach. Steve G. Jones achieves AMAZING and LASTING results!!! Hypnosis is the easiest way to affect change in your life because the positive messages go straight to your subconscious mind effortlessly so you can accomplish your goals and reach for the stars!! All you have to do is listen to the Stop Stuttering Hypnosis MP3 download at night as you go to sleep!!! You’ll hear soft music, the gentle sounds of the beach, and the soothing sound of Steve G. Jones’ voice all working together to bring about positive changes in your life easily and naturally. Steve G. Jones has been helping people improve their lives with hypnosis for over 17 years…now it’s time for him to help YOU… don’t wait, do it NOW !!! you’ll be glad you did. See you at the top! And as you continue relaxing deeper and deeper and more deeply relaxed, I would like you to realize just how powerful you are. Realize what an amazing speaker you are. You are always able to say words clearly and with distinction. Your annunciation is becoming better and better every day and your pronunciation is also becoming better and better every day. Imagine yourself now, in front of a group of people speaking. Notice how smoothly your words flow. Notice that they are interested in what you have to say. They notice you and regard you as a wonderful person and you are okay having their attention on you. From now on you look forward to opportunities to speak publicly. Your words flow out smoothly from your mouth, that’s right. You take time to speak appropriately, that’s right. Before you speak you prepare the first few words in your mind so that when you do speak, those words come out smoothly. Eventually this process will become unnecessary because words will simply flow from your mouth automatically, smoothly every time. Imagine yourself speaking one on one to someone now. Notice how smoothly your words flow from your mouth. You keep the conversation flowing easily, that’s right. Just enjoying having a wonderful conversation with them. Now imagine yourself speaking to an authority figure, someone you respect. Notice how smooth your words flow. You are relaxed and calm the whole time, relaxed and calm. Think the word smooth when you talk, smooth, that’s right. Your words are smooth. You are relaxed when you talk even to an authority figure. Now imagine yourself in an argument with someone, that’s right see yourself arguing. Notice how smoothly your words flow as you think the word smooth. You are able to express your point of view with the other person or with other people even if you are arguing. Words just flow from your mouth easily, naturally, effortlessly, one word after another as if they are just one long word flowing from your mouth and from now on people will regard you as a wonderful speaker, someone who speaks with distinction, someone who speaks clearly and smoothly, someone with wonderful annunciation and pronunciation. Relax now and realize just how powerful you are able to speak clearly in any situation. I’d like you now to imagine yourself in another situation of your choosing. See yourself speaking clearly, expressing exactly what you feel and think. Notice the other person or the other people listening to you, interested in what you have to say. This makes you even more relaxed, even more able to speak smoothly and clearly and you think the word smooth in your mind the whole time, that’s right, smooth. Words flow from your mouth, that’s right. You are always relaxed when speaking, always relaxed. I’d like you to realize that right now your subconscious mind is being programmed to allow you to speak smoothly, easily, almost effortlessly every time you speak. Your words flow together, one word connects to the next in a smooth flow of words. And these words make a smooth flow of sentences. And these sentences make up a smooth flow of paragraphs and these paragraphs allow you to express what you feel and what you think easily, smoothly, effortlessly. You are an amazing speaker. And from now you will think of yourself as an amazing speaker because that is what you are, an amazing speaker, a wonderful, amazing, powerful, smooth speaker. So relax and realize that everything is going to be just fine because your subconscious mind is now programmed to allow you to speak smoothly. Over the next few weeks I would like you to make a plan to find numerous different opportunities in which you can speak to others. The more experience you get speaking to others, the more comfortable you become speaking smoothly. So over the next few weeks you will look for opportunities to speak to others whether in public or private, social situations or non-social situations, groups or individuals. You will look for numerous different types of opportunities in which you can speak to demonstrate to yourself and others just how smoothly you speak now, that’s right, smoothly. You look for opportunities to speak to people on the phone. See yourself talking on the phone now, smoothly. One word connects to the next, that’s right. You look for opportunities to speak to others. This allows you to become more and more confident as a speaker. So relax even more deeply now and realize that everything is going to be just fine. The exact cause of stuttering is unknown to the medical community. Doctors and researchers agree that stuttering is not caused by anxiety or low self-esteem, but stuttering tends to get worse when the sufferer feels stressed in some way. Hypnotherapy is a safe and natural way to reduce stuttering in your life. The Stop Stuttering Hypnosis MP3 session will train your subconscious mind to speak easily, effortlessly, and fluidly. With time and focus with hypnotherapy, you can overcome stuttering once and for all! We suggest you listen to the Stop Stuttering Hypnosis MP3 audio for 21 nights in a row as you go to bed. 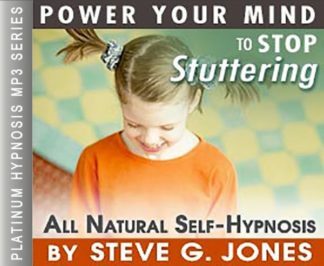 You will hear the relaxing voice of Steve G. Jones as he delivers powerful suggestions to your subconscious mind to help you stop stuttering!